More cute hats and a baby cocoon! Crochet this darling Totally Tam which, with one basic design, transforms into two distinctive looks: a chic beret for her and a cool slouchy beanie for him. 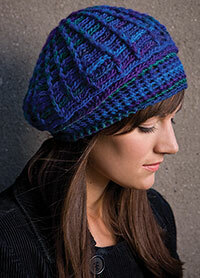 An interesting ridged pattern using post stitches makes both hats plush and warm. Instructions given for small/medium; changes for large/X-large are in [ ]. Chain-2 at beginning of round does not count as first double crochet unless otherwise stated. When working back post double crochet decrease, work same as double crochet decrease, working back post double crochet stitches instead of double crochet. Rnd 11: Ch 2, fpdc around first fpdc, *bpdc around each of next 2 bpdc, 2 bpdc around next bpdc, bpdc around next bpdc, fpdc around next fpdc, bpdc around each of next 5 fpdc**, fpdc around next fpdc, rep from * around, ending last rep at **, join in beg fpdc. Rnd 12: Ch 2, fpdc around first st, *bpdc around each of next 5 bpdc, fpdc around next fpdc, bpdc around each of next 2 bpdc, 2 bpdc around next bpdc, bpdc around each of next 2 bpdc**, fpdc around next fpdc, rep from * around, ending last rep at **, join in beg fpdc. Rnd 13: Ch 2, fpdc around first fpdc, *bpdc around each of next 2 bpdc, 2 bpdc around next bpdc, bpdc around each of next 2 bpdc, fpdc around next fpdc, bpdc around each of next 6 bpdc**, fpdc around next fpdc, rep from * around, ending last rep at **, join in beg fpdc. Rnd 14: Ch 2, [fpdc around all fpdc and bpdc around all bpdc] around, join in beg fpdc. Rnd 15: Ch 2, [fpdc around all fpdc and bpdc around all bpdc] around, join in beg fpdc. Rnd 16: Ch 2, [bpdc dec (see Stitch Guide and Pattern Notes) around first 2 sts, bpdc around each of next 5 sts, [bpdc dec around next 2 sts, bpdc around each of next 5 sts] around, join in beg bpdc dec.
Rnd 17: Ch 2, bpdc around each of first 10 sts, bpdc dec around next 2 sts, [bpdc around each of next 10 sts, bpdc dec around next 2 sts] around, join in beg bpdc. Rnds 16 & 17: Ch 2, [fpdc around all fpdc and bpdc around all bpdc] around, join in beg fpdc. Rnd 18: Ch 2, bpdc dec around first 2 sts, [bpdc dec around next 2 sts] around, join in beg bpdc dec.
Rnd 19: Ch 1, sc dec (see Stitch Guide) in first 2 sts, [sc dec in same st last worked in and in next st] around working last st in last st worked in and first st worked in, join in beg sc. Rnds 20-26: Rep rnd 19. At end of last rnd, fasten off. When working back post double crochet decrease, work same as double crochet decrease working back post double crochet sitches instead of double crochet. Rnds 10-12: Ch 2, [fpdc around all fpdc and bpdc around all bpdc] around, join in beg fpdc. Rnd 13: Ch 2, fpdc around first fpdc, *bpdc around next bpdc, bpdc dec (see Stitch Guide and Pattern Notes) around next 2 bpdc, bpdc around next bpdc**, fpdc around next fpdc, rep from * around, ending last rep at **, join in beg fpdc. Rnds 14-17: Ch 2, [fpdc around all fpdc and bpdc around all bpdc] around, join in beg fpdc. Rnd 18: Ch 2, fpdc around first fpdc, *bpdc around next bpdc, bpdc dec around next 2 bpdc**, fpdc around next fpdc, rep from * around, ending last rep at **, join in beg fpdc. Rnds 19-20: Ch 2, [fpdc around all fpdc and bpdc around all bpdc] around, join in beg fpdc. At end of last rnd, fasten off. Rnds 18-29: Ch 2, [fpdc around all fpdc and bpdc around all bpdc] around, join in beg fpdc. At end of last row, fasten off. Copyright © January 2011 Crochet! magazine. All rights reserved. Easy peasy garter stitch pattern for cowl and hat. 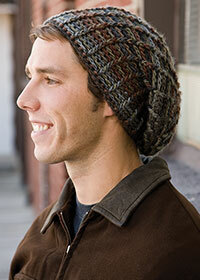 Knitted with worsted weight yarn, double strand. Some hand knitting, some machine knitting! What’s a girl to do in her spare time? Knitting – of course! Found this nice little hat pattern: Criss Cross Hat Pattern.